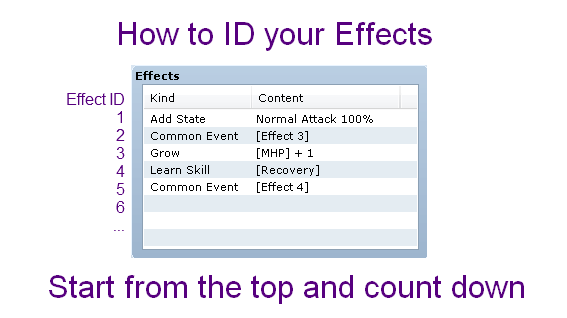 By default, effects assigned to skills or items are executed after skill or item is executed. This script allows you to specify that certain effects should be executed before the skill or item is executed. Where the ID is the effect the ID of the effect. You can figure out what the ID of the effect is by counting their position in the list from top to bottom. The effect at the top has ID 1, the one under it has ID 2, and so on. By default, the engine does not support multiple common events in a single skill. You can use the Common Event Queue script or any other script that allows you to run multiple common events to overcome this limitation. I have downloaded this script and then installed in the plugin center of rpg maker mv. pre skill effect: 2> in the skill notetag, but it doesn’t work. I am using all the plugins from YEP. This is an Ace script. I cant seem to download it… help? It works for me. Is there an error message? I was wondering if it’s possible to set this up so you can get different cut-in images on the same skill depending on the actor? Try using common event variables, which will store information such as the user’s ID into a variable. If it doesn’t work it may require a compatibility patch to support this script. Hey Hime. First of all, thanks for making this script! There’s a lot of really neat things that can be done with it. However, after playtesting my game, I noticed that battle events that used the Force Action command were not working anymore (If a Force Action was called, it would simply freeze the game). I tried checking my scripts and it seems that if I put this script above Yanfly’s Ace Battle Engine script, then Force Actions would work again, but the Pre-Skill Effects script would stop working (The common event doesn’t get called). This probably falls under the category of a compatibility issue and I know you said that you wouldn’t do any compatibility patches, but it would help me a lot if you could help clarify the issue for me and I can try to work around it. Thanks! I will need to look at the issue, but have you tried adding yanfly’s core engine? Yes, I am already using Yanfly’s Ace Core Engine script. The problem seems to persist with and without the core engine script. Hello, I have the same problem, it would be a pity if not have solution. a = ID of the party member who performs the action. b = ID of the skill. c = Select the target: -2 for the last target; -1 for random target and 0 or more for each enemy of the troop. pre-skill effect: ID>.” This script doesn’t work if you include that hyphen, so you may want to remove it. Thank you for this script, and take care! Hmm, it should work with hyphen, underscore, or space. Will look at it again.